When you travel to or from Phoenix, it is a good idea to make everything as easy on yourself as possible. From the quickest way to book your flight to the most efficient way to get from the airport to your hotel, it is all about making life simple. The simpler the process, the less that can go wrong. That is why you should consider booking Phoenix airport parking in advance, and make one more step in the process easy and worry free. There are ten airport parking lots at Phoenix Sky Harbor Airport (PHX) for you to choose from, and they are all located to the northeast of the airport terminal. 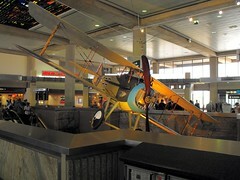 Phoenix Sky Harbor International Airport, often known just by the nickname “Sky Harbor,” is located off I-10 in the Phoenix metro area. It’s one of the world’s busiest airports, though not within the top ten, and serves as a hub for both US Airways and the popular low-cost airline Southwest Airlines. The many eateries and shops (including the ones with typically Southwestern gifts) at the Phoenix airport will try to tempt you into parting with your money, but for a free distraction while you are waiting for your flight, check out the free WiFi throughout the airport. For traffic information, see the AZ 511 website. Planning a long drive to or from the airport, or an odd-hours flight? Check out Phoenix Airport (PHX) park and sleep hotels. Don’t fancy driving to the airport? Or leaving your car there and paying for parking? Catch a shuttle to Sky Harbor airport.